A 6-year-old systemically healthy Caucasian boy presented with decreased vision in the left eye (OS) for 10 months. Visual acuity was 20/30 in the right eye (OD) and 20/400 OS with relative afferent pupillary defect OS. Intraocular pressures were normal in both eyes (OU). Funduscopy revealed swollen, elevated optic disc OU, with indistinct disc margin and cup/disc ratio of 0 [Figure 1]a. Superotemporal to the disc in OS, there was subretinal hemorrhage with central subretinal fibrosis. Blood pressure and body temperature were normal. 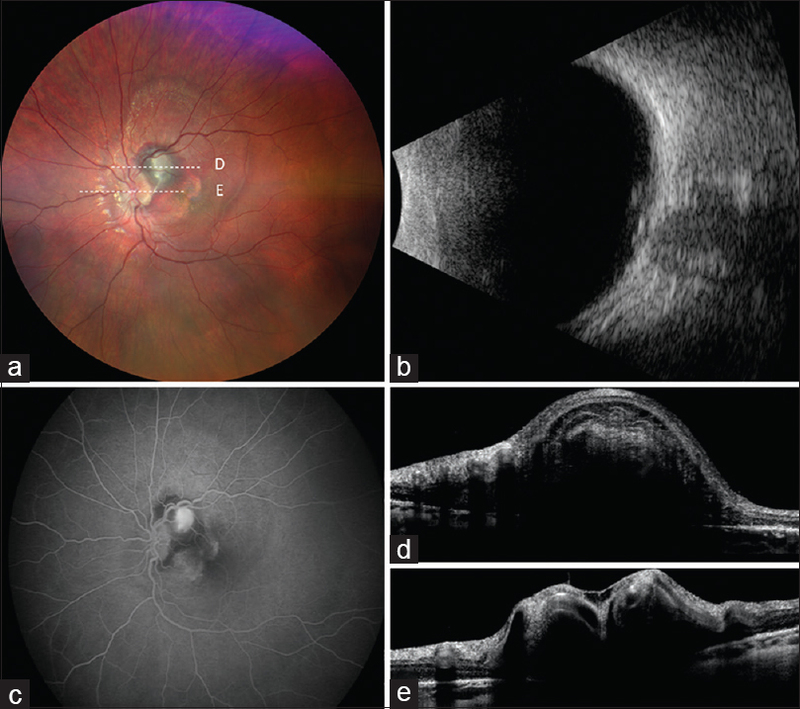 Perform additional ocular diagnostic imaging with B-scan ultrasonography, optical coherence tomography (OCT), and fluorescein angiography (FA). B-scan ultrasonography showed a small scleral canal and optic disc hyperreflectivity, suggestive of calcified optic disc drusen (ODD) OU [Figure 1]b. FA showed early hyperfluorescence with late staining at the site of blood, suggestive of choroidal neovascular membrane (CNVM) [Figure 1]c. OCT over the hemorrhage [Figure 1]d revealed subretinal hyperreflective CNVM with buried drusen at the optic disc [Figure 1]e. Brain and orbit magnetic resonance imaging (MRI) showed no mass. These findings were consistent with CNVM arising from ODD. Intravitreal bevacizumab resulted in CNVM regression after 1 month. Bilateral optic disc swelling can result from papilledema or pseudopapilledema. The latter is a group of optic disc abnormalities including hypoplastic, dysplastic, or tilted optic disc, persistent hyaloid remnants, ODD, and others. True disc swelling warrants immediate MRI evaluation for intracranial mass or venous sinus thrombosis. ODD are acellular deposits believed to result from a tight scleral canal that leads to axoplasmic stasis. ODD are present in 0.4%–2.4% of eyes on autopsy and 14.6% by OCT. ODD are bilateral in 75%, increase in size and calcification with age, and can cause visual field defects. CNVM is a fairly common complication, found on OCT in 24 of 98 pediatric eyes (24.5%) with ODD. The CNVM typically responds to intravitreal anti- vascular endothelial growth factor medication. Gema R, Aki K, Victoria de J, Noelia O, Francisco Jose MN. Optical coherence tomography to differentiate papilledema from pseudopapilledema. Curr Neurol Neurosci Rep2017;17:74-87. Claudia AH, Flemming S, Heinrich W. Optic disk drusen. Surv Ophthalmol 2002;47:515-32. Jared ED, Sharon FF, Mays A El-D. The incidence of neovascular membranes and visual field defects from optic nerve head drusen in children. J AAPOS2016;20:44-8.